Most people think of carrots as useful, healthy, and very boring. This recipe for “Carrot Torte” puts paid to all that. I found it in a German cookbook that dates back to 1910 or so. I have 4th edition, published in 1918, the year WWI ended and most Germans were literally starving. I’m sure recipes like this one (and the cookbook is full of them!) were the stuff of dreams then. Be sure to use flour made from unblanched (skin-on) almonds—not blanched almonds. If you cannot make the flour yourself, using a nut grinder (NOT a food processor! ), you can buy it on the net from Bob’s Red Mill as “Superfine Natural Almond Flour.” Cedars, on Bank Street, and some organic stores carry it as well. Grate, do not shred, the carrots on a block grater. Resist the urge to use a food processor—it will either not grate them finely enough or turn them into mush. Kirschwasser is an eau de vie. If you cannot find Kirschwasser, omit it and add a tablespoon of lemon juice instead. 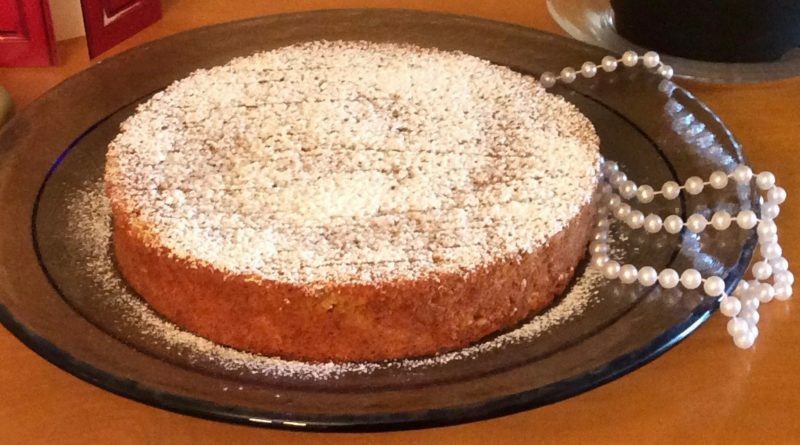 The torte is too delicate for the strong flavours of cherry brandy or cherry liqueur. This recipe makes two cakes. If you need just one, either freeze the second one or cut the recipe in half. Generously butter two 9×3” springform pans and dust them lightly with flour. Beat the egg whites until stiff but not dry, reserve. Mix the flour, cinnamon and lemon zest, reserve. In a very large bowl, beat the egg yolks with the sugar until the mixture has doubled in volume and forms a ribbon when falling from a spoon—10 to 15 minutes using an electric beater. Add the carrots and continue beating for 5 minutes. Fold in the remaining ingredients except the egg whites. Briefly beat the egg whites. Fold in ¼ of them, then fold in the rest. Divide the batter evenly between the baking pans and bake for 35 minutes at 375ºF, turn the oven down to 350º and bake for 25 more minutes, or until the torte shrinks from the sides of the pan. Test with a bamboo skewer for doneness if in doubt. Let the torte cool in the pan for 10 minutes, remove it from the pan to a rack and let it cool completely. 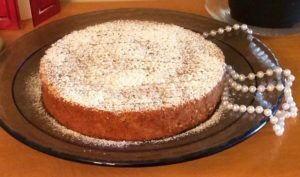 Dust with confectioner’s sugar before serving it with or without whipped cream. Happy feasting!